One of the most venerable old axioms of fur trade history is that of Colter's Hell, which may be formulated thus: "After John Colter discovered what is now Yellowstone National Park, he told others of the scenic wonders there. No one believed him, and his listeners derisively dubbed the imaginary place Colter's Hell." No item of Yellowstone history is more widely believed, more universally beloved, and more transparently incorrect. There was a Colter's Hell in the fur trappers lexicon, which referred specifically to an ancient thermal area bordering the Shoshone River just west of present Cody, Wyoming. The term was never applied historically to the thermal zone within Yellowstone Park itself. It was Hiram M. Chittenden, the esteemed engineer and historian who first suggested this usage in 1895 with the original edition of his book, Yellowstone National Park. The earliest published reference to "Colter's Hell" is in Washington Irving's version of Capt. Benjamin L. E. Bonneville's journal narrating events from 1832 to 1835. However, note here that this "volcanic tract" with its "gloomy terrors, its hidden fires, smoking pits, noxious streams and the all-pervading 'smell of brimstone'" was located, according to Irving, not on the headwaters of the Yellowstone but on the Shoshone or "the Stinking River" or "the Stinkingwater," originally named on the Clark Map. It was Chittenden in 1895 and not Irving in 1837 who started the legend by asserting vaguely that "the region of ... [Colter's] adventures was long derisively known as 'Colter's Hell'" implying that by "region" he meant Yellowstone Park, the subject of his book. He does not accuse Bonneville or Irving of error, perforce conceding that "this name early came to be restricted to the locality where Colter discovered the tar spring on the Stinkingwater," but he hopefully guesses that "Colter's description, so well summed up by Irving . . . undoubtedly referred in large part to what he saw in the Yellowstone and Snake River Valleys." This is where the misconception got started. It is significant that no historian prior to Chittenden entertained this misconception. For example, in 1890 Hubert H. Bancroft wrote: "Far east of ... [the volcanic basins on the Upper Madison], on the Stinkingwater Fork . . . is Colter's Hell, where similar phenomenon is exhibited on a lesser scale." It is further significant that in his monumental American Fur Trade of the Far West, the first edition of which appeared in 1902, seven years after the first edition of Yellowstone, Chittenden wrote that Colter was "the first to pass through the singular region which has since become known throughout the world as the Yellowstone Wonderland. He also saw the immense tar spring at the forks of Stinkingwater River, a spot which came to bear the name of Colter's Hell." This is his only reference here to the term, which is a clear if tacit admission that he was in error in the first instance to create the impression that it ever applied contemporaneously to Yellowstone Park. But the impression once created would not down. Like Aladdin's wonderful lamp, the jinni was out of the bottle, and the poetic version of "Colter's Hell" has become a stock item in Western literature. Colter Monument. Photo by Author. Defenders of the Colter's Hell mythology are eager to challenge Washington Irving as an authority. True, Irving's Captain Bonneville by his own admission never personally saw the Yellowstone Park area. Also, it is true that geysers are not to be seen today along the Shoshone River. Hence it might be reasoned that the only noteworthy thermal activity in 1807 was likewise confined to the Yellowstone (more particularly, to the upper Madison), and that Bonneville was merely reporting a twisted rumor. But a cold examination of the facts shows that Irving and Bonneville were correct. First, there is no good reason to question Bonneville's geographical knowledge. 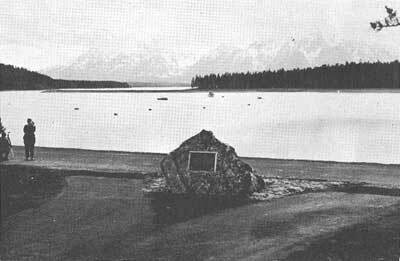 While he never saw it himself, Bonneville had quite a crew circulating through the future park as early as 1833 and, in fact, there is reason to believe that the great geyser basin of Firehole River, climaxed by Old Faithful, was discovered that year by one of his own lieutenants (see Chapter VII). Secondly, although there are no phenomena readily apparent to passing motorists at the bona fide and unmarked Colter's Hell site just west of Cody, the evidence of thermal activity, not entirely extinct now, is abundantly evident to anyone who cares to pause enroute to or from Yellowstone's East Gate. On the Canyon rim downstream from the rocky defile enclosing the Buffalo Bill Dam, there are extinct geyser cones up to thirty feet in height and an extensive crust of fragile sinter. In the canyon floor itself there are bubbling fountains in the river bed, and the same pervasive smell of rotten eggs, (or more scientifically, sulphur dioxide) which assails one's nostrils on the Upper Firehole. (Other related hot springs once existed at the forks of the Shoshone, now drowned beneath the reservoir). 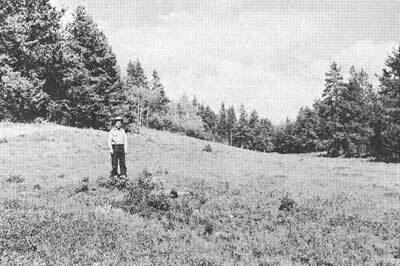 Colter Stone Find Site (Wyoming). Photo by Author. How very strange that this spot, quite evidently the "Boiling Spring" of Colter's famous route on the William Clark Map of 1810, has been largely ignored since 1895. Campfire writers and lecturers have been so enchanted by the Yellowstone "Wonderland," they never gave thought to this historical-geological feature 50 miles outside of the Park boundary. Thirdly, Bonneville wasn't the only one who knew about the phenomena on the Stinkingwater. 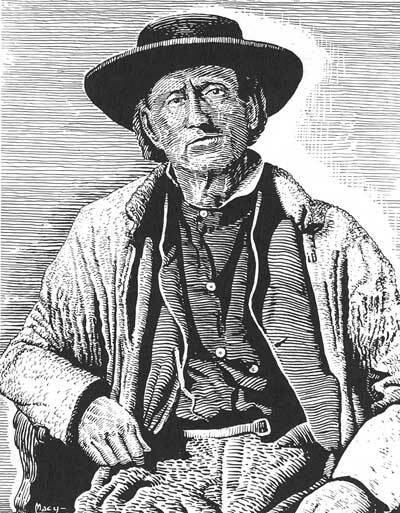 The true identity of Colter's Hell was well understood by other mountain men. In 1829 Joe Meek knew all about steam vents "on the Yellowstone Plains," but he also was familiar with a volcanic tract on "Stinking Fork," previously "seen by one of Lewis and Clarke's men, named Colter, while on a solitary hunt, and by him also denominated 'hell.'" In 1852 the famed missionary-explorer, Father De Smet, cited "Captain Bridger" as the source of his information that, "Near the source of the River Puante, which empties into the Big Horn . . . is a place called Colter's Hellfrom a beaver-hunter of that name. This locality is often agitated with subterranean fires . . ."
Stallo Vinton, early Colter biographer and editor of the 1935 edition of Chittenden's American Fur Trade, paid no attention to Chittenden's footnoted correction of 1902. Rather, he did more than anyone, perhaps, to exterminate the true Colter's Hell and pin the name on the National Park. He accuses Irving of a substantial error in locating "Hell" on the Stinking River. Similarly, he ignores Joe Meek's careful distinction between the Yellowstone and Shoshone volcanic tracts. In 1863 Walter Washington DeLacy accompanied a party of Montana gold-seekers through the Yellowstone Park area. Although his companions were too absorbed in the search for the precious metal to pay any attention to the scenic wonders, DeLacy, a surveyor by trade, did pay attention and subsequently published a crude but illuminating map of the Park region. Here the principal geyser basin on Firehole River is called "Hot Springs Valley." And far to the east, near the forks of the Shoshone is a "Hot Spring, Colter's Hill." [sic] In 1867 the official map of the Interior Department, by Keeler, apparently reproducing DeLacy's data, also indicates a "Hot Spring, Coulter's Hill." [sic] So the Federal Government, at this early date, gave this official recognition to the clear distinction between the two thermal areas. Vinton refers to the DeLacy and Keeler maps but he dismisses this further evidence as a mistake. Perhaps his stubborn version of Colter's Hell would have collapsed if he had seen the recently discovered Bridger-DeSmet Map of 1851, in the Office of Indian Affairs. Here Bridger also clearly distinguishes between "Sulphur Spring or Colter's Hell Volcano" on Stinking Fork and an entirely different "Great Volcanic Region in state of eruption" "drained by Firehole River. (See Chapter VIII.) Can we invoke any higher authority than Jim Bridger?